Treat yourself to the gift of "feel good" low carb snacking. Health Conscious and Diabetic Friendly. - Balanced2Thrive blend of flours (Sunflower Seed flour, GF Oat flour, Sorghum flour, and Flaxseed meal) offers a powerhouse of health benefits. - Nutrient dense ingredients that suppress hunger and gives lasting energy. - Type 1 Diabetics report low to no spike of blood sugar. - Healthy fats and zero Trans fat reduces sugar cravings and helps you feel satisfied longer. - Organic, fair trade Gerkens Cocoa is known for its intense premium chocolate taste and boosts endorphins. - A tasty snack for diabetics or a keto chocolate low carb and paleo dessert. Each serving has only 1g NET CARBS, compared to other gluten free brownies at 26g NET CARBS. - American Diabetes Association recommends food with less than 5g Net Carbs for between meal snacking. - Sugar Alcohols and Dietary Fiber have a minimal effect on blood sugar, and so they should be deducted from total carbs, if you are counting carbs. - We use a healthy alternative to sugar called Erythritol, a FDA GRAS certified sugar alcohol. It is a sugar free natural sweetener that has no stomach upset, unlike other sugar alcohols, and has less after-taste that other natural sweeteners. - And, erythritol has 1/16th the calories of sugar! Not your ordinary gluten free low carb brownie mix. 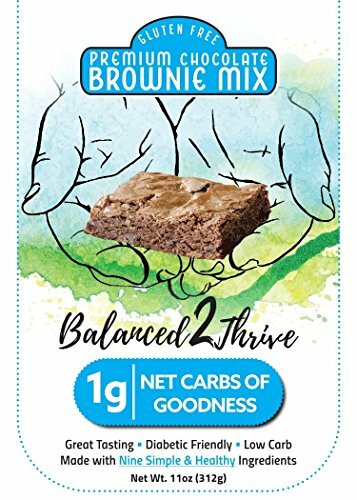 - Balanced2Thrive brownie mix uses a blend of flours to balance blood sugar levels for a delicious low glycemic dessert. - Rice flour is used by other gluten free brownie mixes with a high GI and spikes blood sugar. - Prebiotic Fiber is used by other low carb brownie mixes, with a GI of 35, and may spike blood sugar. - Made in USA in a dedicated gluten free facility and is Top 8 Allergen Free. Donates 10% Net Proceeds to JDRF(Juvenile Diabetes Research Foundation) to help Fund Research for Type 1 Diabetes. If you have any questions about this product by Balanced2Thrive, LLC, contact us by completing and submitting the form below. If you are looking for a specif part number, please include it with your message.